We’ve never understood why it’s so important for Ferraris to be red. Always struck us as a little silly to spend hundreds of thousand of pounds on something a whole bunch of other people have got. And there’s something about the 250, especially the SWB version of the classic GT, that works so well in colours other than the usual. 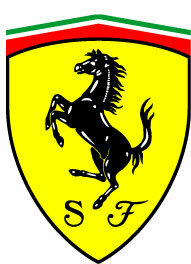 The cognoscenti will argue for hours over wether or not yellow (giallo modena in current range parlance), is, in actual fact, the original colour of Ferrari (notice the prancing Ferrari horse is set agains the dominant yellow shield). But then, with blue being the traditional colour of French racing, then the fact that the blue 250 above is in powder blue livery seems wholly appropriate. But it’s perhaps in the bare sheet metal grey of a true competizione model where this particular ferrari shines brightest. The most beautiful car is, to quote Enzo Ferrari himself, the one that wins.